Gathering fish, kelp, seafood. / That’s why it’s got the open weave, so water drains. This Unangax^ grass basket has an open weave that allowed for air and drainage when storing fish, seaweed, sea urchins, mussels, clams, or other seafood. Grass harvested late in the summer or even after the first snowmelt is preferred for this type, because it is longer and stronger than grass picked in mid-summer. The basket is decorated with colored yarn. Aron Crowell: What would [a basket] like this be used for? Maria Turnpaugh: Berries maybe. It’s some kind of utility basket . . . or a gathering basket … because it has an open weave. Daria Dirks: It looks like a catch-all basket. 1. 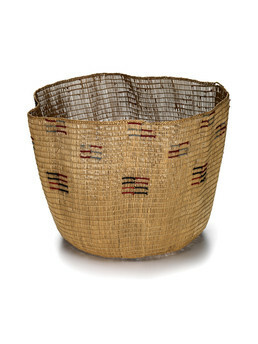 According to Mary Bourdukofsky, this type of basket is called ayg^ag^esix^ [carrying basket].